What’s the scuttlebutt around the 99th Precinct, during the sixth season of the Brooklyn Nine-Nine TV show on NBC? As we all know, the Nielsen ratings typically play a big role in determining whether a TV show like Brooklyn Nine-Nine is cancelled or renewed for season seven. Unfortunately, most of us do not live in Nielsen households. Because many viewers feel frustration when their viewing habits and opinions aren’t considered, we’d like to offer you the chance to rate all the Brooklyn Nine-Nine season six episodes for us, below. An NBC police procedural sitcom, Brooklyn Nine-Nine stars Andy Samberg, Andre Braugher, Terry Crews, Melissa Fumero, Joe Lo Truglio, Stephanie Beatriz, Chelsea Peretti, Joel McKinnon Miller, and Dirk Blocker. The comedy follows Detective Jake Peralta (Samberg) and the rest of the unique detectives and officers at the NYPD’s 99th Precinct. What do you think? 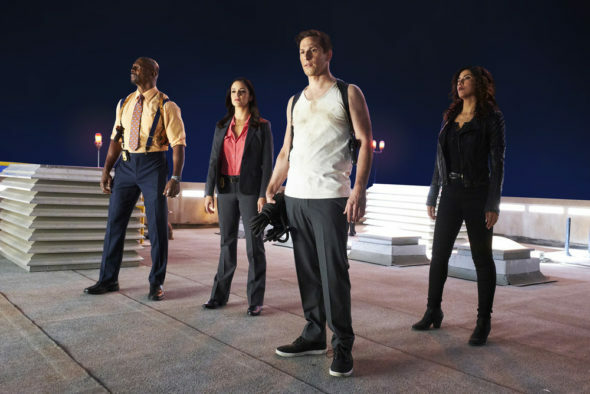 Which season six episodes of the Brooklyn Nine-Nine TV series do you rate as wonderful, terrible, or somewhere between? Should NBC cancel or renew Brooklyn Nine-Nine for a seventh season? Don’t forget to vote, and share your thoughts, below.